Help Us Fight Hunger & Spark Change Right Now! As a participant in this campaign with Walmart, I have received compensation for my time and efforts in creating this post. All thoughts and opinions are my own. I have always shopped at Walmart for my family, for various reasons. It doesn’t take much to see that I can do a pretty good bit of saving there, especially when I have their Savings Catcher app. Not too long ago, I had to make sure that we were getting the most out of our shopping. I had to be very strategic about it and what I purchased had to count. For many that know my family, what they probably didn’t know was just how tight things were financially. Sad to say, I knew we weren’t alone. But who really likes to discuss their personal struggles with others that think they may have it all together? But that has to change. Conversations that we may be afraid to have and problems we are hoping just magically disappear isn’t good for anyone. We need to start being realistic about things. One of the most realistic conversations we SHOULD be having with our neighbors, friends and family is the one about hunger. According to the USDA, 1 in 6 Americans may struggle with hunger. Did you hear me? 1 in 6! I’ve met some of those families struggling. We came very close to being one of those families. It doesn’t take much to be in that position. Anything can happen in the blink of an eye. But guess what? It also doesn’t take much to help someone out of it either. It’s simple. With the help of you, your shopping list for this week and a quick trip to the store, head over and purchase any of the items found here at Walmart. You’ll have plenty of items to choose from as Walmart has partnered up with many of your favorite brands – like Campbell’s, ConAgra Foods, General Mills, Kellogg’s, Kraft, Unilever – to help Feeding America Food Banks nationwide reach their goal of 75 million meals, which they are so close to reaching! You can help us fight hunger and spark change RIGHT NOW! Purchase a specially market item from the list mentioned above. Here is the link again. This item will equal 1 meal. Head to the register and donate. You can give monetary donations of $1, $2, or $5 to your local Feeding America Food Bank at the register of any participating Walmart. Get social! Grab 6 of your friends, family or co-workers and share your smiles. 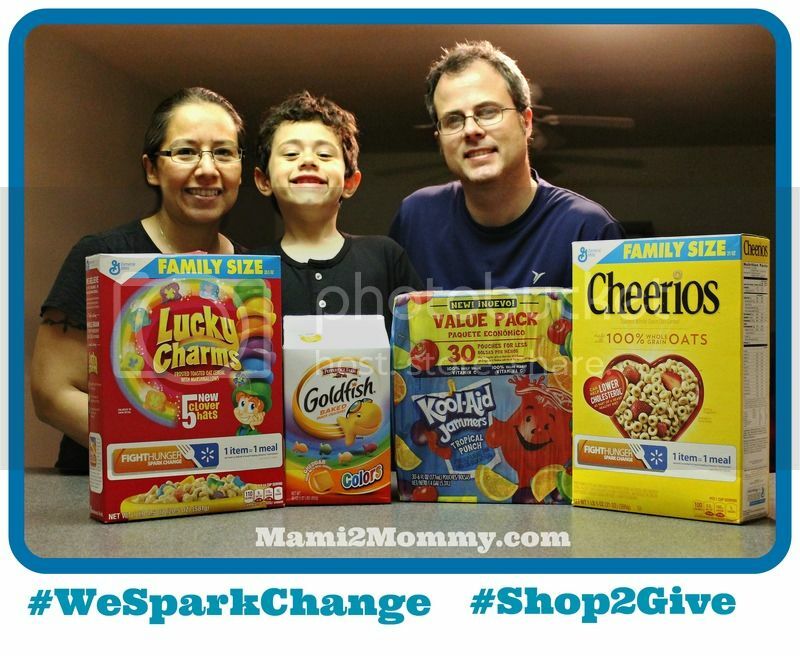 Use the hashtag #WeSparkChange all over your favorite social sites. Just be sure to make any photos public. Let’s do this together and spark the change that can mean the world to someone and their family…a family quite possibly just like yours or mine. DISCLAIMER: Walmart is not responsible for donating the meals, the supplier partners listed above are responsible for that. FOOTNOTE: *The monetary equivalent of meals will be donated. $0.10 is equivalent to one meal secured by Feeding AmericaⓇ on behalf of local member food banks. See Walmart.com/FightHunger for details. « Hot Pursuit – Movie Trailer & Giveaway Announcement! #Hispz Year End Review Twitter Party!